The event comprised two days of activities: a ‘press day’ and bloggers’ meet-and-greet event on the Friday and an ‘all-comers’ day on the Saturday. I attended both – the Friday afternoon under my own steam and the Saturday on behalf of the wonderful F&F Clothing. This post is about the Friday event – my post about Saturday can be read here. Despite having had an extremely hectic week at work, I was very excited to be taking part in the BPSFW and I was looking forward to meeting up with some of my blogger friends, as well as being a part of something that sounded amazing. The BPSFW aimed to “…enhance, educate, empower and support the UK plus-size industry by connecting the dots between the retailers, designers and consumers”. Setting their sights high, founders Remi Ray (Trapped In A Skinny World) and Rianne Ward (Evolve Magazine) wanted to create the biggest plus-size fashion event that had ever been held in the UK. Having previously attended Plus London Two and Plus North last year, I was eager to be part of something that promised to be bigger and better. On Friday afternoon, the press event was held in an attic room at Beach Blanket Babylon in Shoreditch, east London. It was rather a fiddly location to get to as Shoreditch isn’t on a tube line but we got the underground and then eventually the overground and were pleased to find that the venue was right across the road from the station. I attended with my friend Hanna from The Wardrobe Challenge and we were warned before we entered the room that it was very hot in there. Undeterred, we put our best feet forward and ventured inside. The room was indeed VERY hot. The windows had been painted or taped shut and for some crazy reason the heating was on full pelt. Add to that mixture around 100 people and no air conditioning and you can imagine how intense the room felt. It was almost unbearable. Fortunately there was a rail for coats so I quickly dispensed with my black Collectif Ashley coat and spent some time speaking with various bloggers and representatives from the numerous brands in attendance. Considering the difficult conditions, everyone seemed in good spirits and was keen to talk and exchange business cards. It’s a pity that the room was too small for the purpose as it meant that there were too many brands squeezed into too small a space. We constantly felt like we were in the way and people were bumping into each other all the time. I missed talking to several of the brands simply because I could not see them between the masses of clothes rails, banners and people. It really was like a game of (sweaty) sardines!! Despite the crush, it was great to meet up with lots of my blogger friends, including the lovely Mouna from Brussels Fatshion. These two dresses are from Scarlett & Jo at Evans; the left is the gorgeous Coral Rosette Short Sleeve Tunic and the right is the dress I was wearing on the day: the Blue Side Panel Dress. The whole Scarlett & Jo collection is divine and I hear there are lots of exciting new items coming soon – I can’t wait! On the left we have a dress from the amazing Dutch brand GETS. They had some very unique designs on show and I am looking forward to finding out more about them. 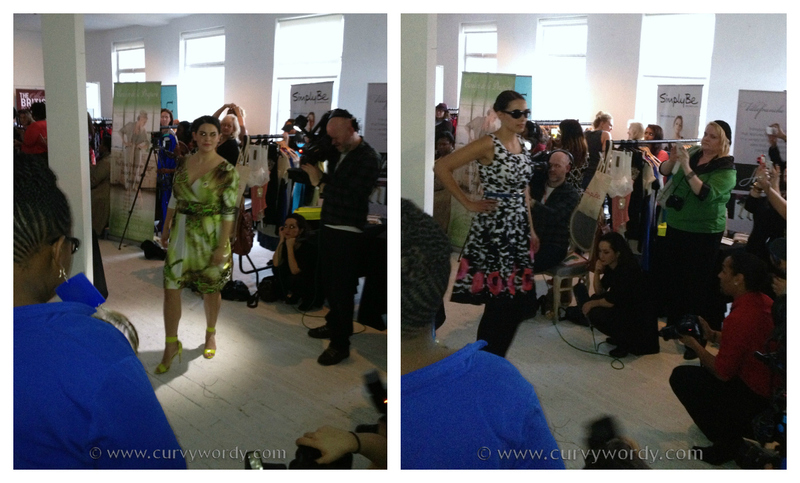 On the right is the stunning Leaf Print Tea Dress from Curvissa. It got heaps of attention and I am sure it’s one that will sell out very quickly so make sure you get one asap if you like it too. There were lots more brands whose clothes were in the show but I’m not going to include any pictures of them as I have no idea what piece belonged to which brand. I know I was squashed into a corner but it would have been really helpful to have an announcement as to what brands were on show, or even just a notice somewhere visible. The room was so hot and humid that the painted floorboards became slippery and a couple of the models fell over during the fashion show. It must’ve been so embarrassing for them – not to mention painful – but they kept their composure beautifully. So professional! I do hope none of them hurt themselves. After the fashion show we were so hot that we couldn’t take any more so Hanna, Mouna and I made our escape. We ended up going to the fab Evans store at Marble Arch…but more on that in a later post! We were given a goodie bag on our way out (well, I wasn’t given one so I had to go all the way back upstairs to ask for one) but its contents were very disappointing. Mine contained a tube of hand cream from Simply Be and a pile of brochures, leaflets and business cards from the brands involved. Not at all what I was expecting from such a highly self-proclaimed event and in fact I would have preferred to have been a simple pack of brochures etc rather than having them somewhat hidden in an oversized gift bag. All in all I enjoyed the press event but I can’t help feeling it would have been far better if it had been held in a different venue with a larger room. It was also less than ideal to have to go up three flights of stairs to get to the attic room, particularly considering one flight did not have a handrail and I am wobbly on my feet at the best of times. I am sure the choice of venue partly came down to cost but there must have been other more suitable options available that would have served the purpose much better. I was very impressed with the amount of press coverage the organisers of BPSFW had managed to get. 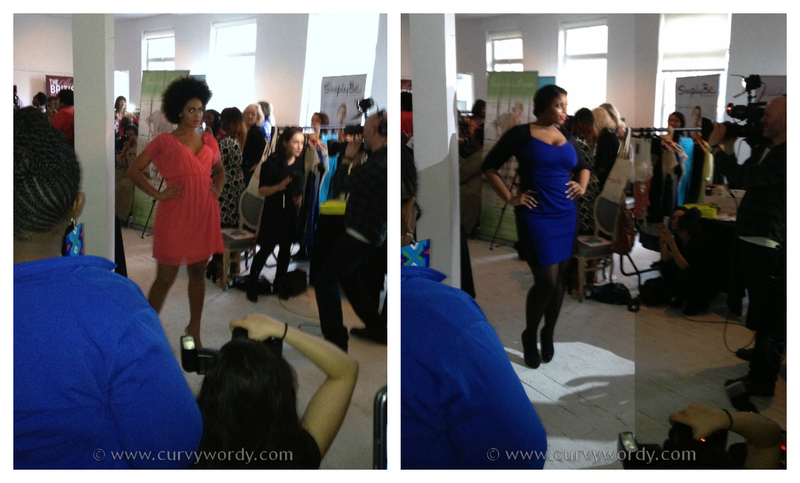 There were a huge number present; far more than I have seen at any other plus-sized event to date. This is great because it means the positive messages of the event were being broadcast as far and wide as possible, which is of course good news for us all. It can’t have been easy for the BPSFW team to put this press day together so they should be congratulated for their hard work. 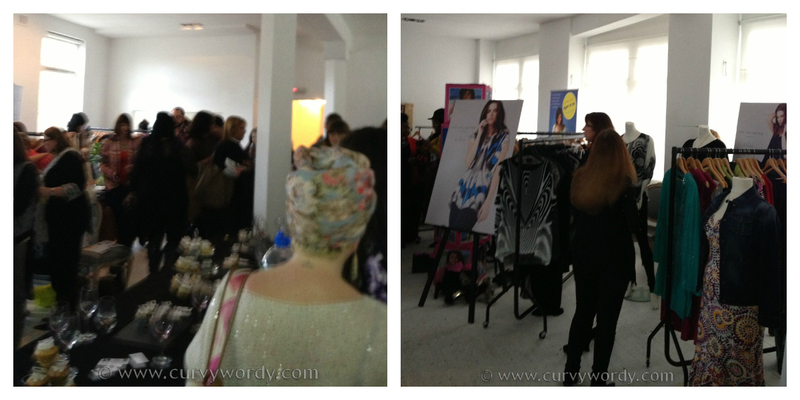 I felt that it was a success, despite the small, hot room, and that the day had achieved its aim – to give the press an opportunity to see what BPSFW was all about and for the bloggers and brands to have the chance to network. I went home on Friday evening feeling tired but happy, and looking forward to seeing what tomorrow would bring.